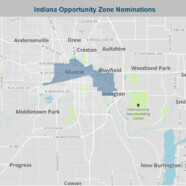 City of Muncie receives Indiana Opportunity Zone tract designations | Vandewalle & Associates, Inc.
MUNCIE, IN: Governor Eric Holcomb submitted Indiana’s 156 Opportunity Zone nominations to U.S. Secretary of the Treasury Steven Mnuchin last week. Four tracts were selected from Muncie-Delaware County. Opportunity Zones are low-income census tracts aimed at spurring private investment, economic growth and local jobs. The goal of this bipartisan economic development program is to bring long-term, private-sector investment to the places and people who need it most. States are required to consider local economic development initiatives and successes with other programs to ensure Opportunity Zone designations equal local results. The process is competitive; while each governor can generally only choose 1 out of every 4 low income tracts in the state, approval as an Opportunity Zone can attract significant capital investment to a low income census tract.